As a toddler, my older son ate almost anything served with "dip-dip," which was usually sweet: ketchup, honey, maple syrup. But he has always made a stinky face at hummus, ranch dressing, baba ghanoush, and any other veggie dip, even as he's grown to love peanut sauce with satay, dipping sauce with pot stickers, and balsamic vinegar and olive oil with bread. I finally figured it out: He likes strong but distinct flavor and hates texture. 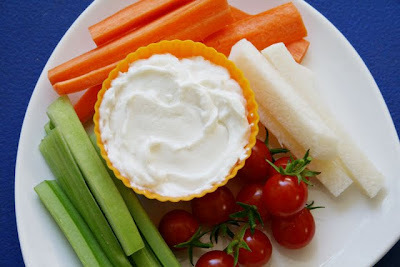 This easy dip satisfies both criteria: Spreadable blue cheese gives this dip assertive flavor without suspicious-looking blue-tinged chunks of cheese. 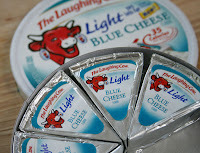 Laughing Cow Light Blue Cheese smooths out the tang of yogurt for a smooth, tasty blend. My favorite combination is with non-fat Greek-style yogurt: very low in fat and loaded with protein. I like to make this with non-fat Greek-style yogurt, which gives this a significant protein boost. Combine cheese and yogurt in a small bowl and blend well. Serve with vegetables for dipping. Makes about 3/4 cup of dip.